Discovering new cultures exposes you to more experiences (good and bad). One way to do that is try the local food. From cocktails to cuisine here is a nod to some of Peru's must try dishes. 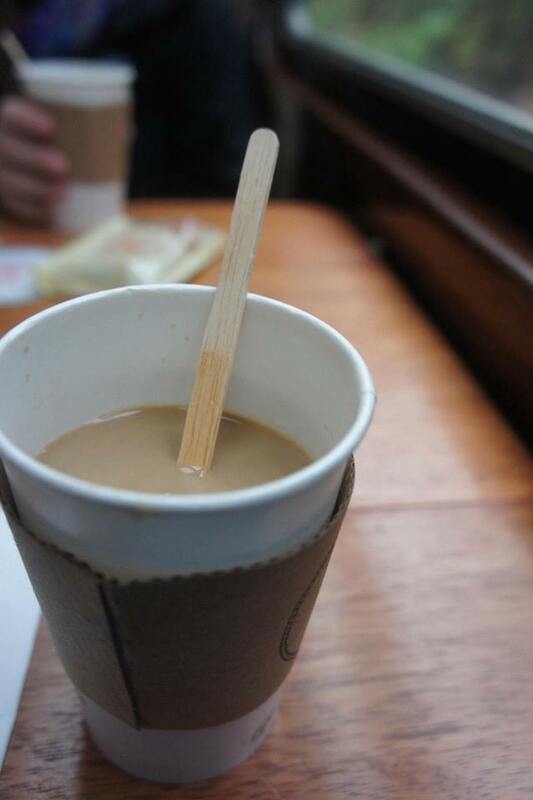 When I travel, I try to immerse myself in new cultures as much as I can. I feel you get a better sense of your surroundings, and grow more as a person. Discovering new cultures exposes you to more experiences (good and bad). One way to do that is try the local food. From cocktails to cuisine here is a nod to some of Peru's must try dishes. 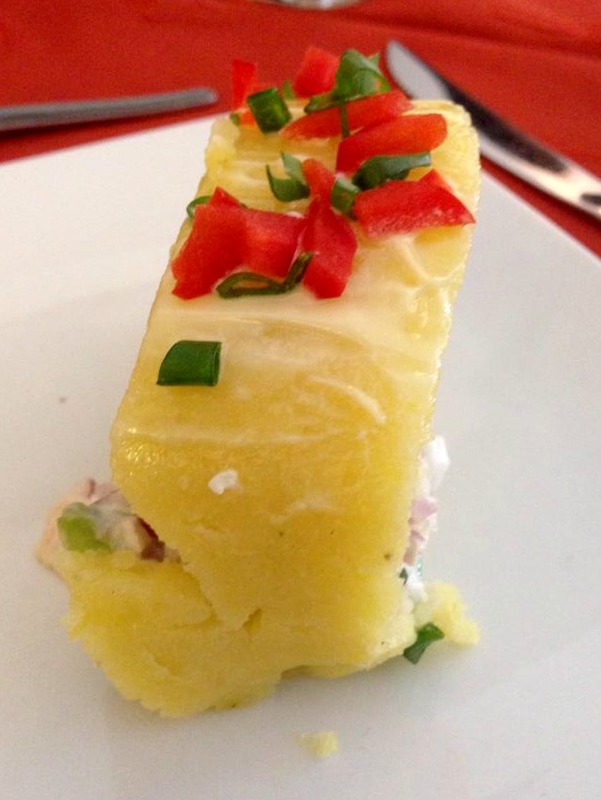 Causa Rellena is a Peruvian mashed potato pancake dish, which is layered with fish, chicken or vegetables. Peru has over 4,000 varieties of potatoes, but this dish is made with yellow-golden Peruvian potatoes. The top is decoratively garnished with herbs and a hard-boiled egg. We were served Causa Rellena stuffed with vegetables. It was so good I asked for the recipe to bring home with me! Pisco Sour is an alcoholic drink that is served in Peru. It is made of lime juice, Pisco (clear grape brandy) for the base liquor, syrup, ice, bitters and egg white. The egg white is whipped to give the Pisco Sour its foamy top. This is a drink that tour guides will warn foreign visitors about, because of the raw egg that is incorporated in the drink. This may be a drink you want to avoid, if you have a sensitive stomach. It's fun to compare foods between countries. The best margarita pizza I have ever had was at La Pizza Carlo located in Cusco. This is an intimate family-run restaurant with four tables inside. The ingredients were deliciously fresh, and the pizza is cooked in a brick oven. The atmosphere itself was very warm and welcoming. The owner was very friendly and immediately welcomed guests inside. Bring cash with you (American or soles), credit cards are not accepted here. Insider tip: try the homemade sangria, you won't regret it! Ceviche is raw fish marinated in citrus juices in order to slowly cook the fish. It is usually served with peppers, corn or sweet potatoes. This is a dish that comes highly recommended by anyone who visits Peru. If you would like to make this dish yourself, stop by San Pedro Market in Cusco for fresh seafood, collected off the coast of Peru. Alpacas are bred in Peru for their wool and meat, and at one time was considered a delicacy. 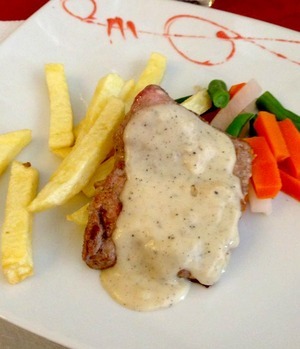 Now you can find Alpaca meat served at most restaurants in Peru. You will find Alpaca to have a taste and texture similar to pork tenderloin. Don't be afraid to step out of the box on this one, you will be pleasantly surprised. I fell in love with this fruit at the San Pedro Market in Cusco. I'm not the only one to fall in love with it, Mark Twain referred to it as "the most delicious fruit known to man". Cherimoya is small, green oval fruit. It's sweet to taste (a blend of banana, strawberry, pineapple flavor). It can be cut up and frozen, or chilled and ate with a spoon. Throughout Peru, Chirmoya can also be found in ice cream and yogurts. Inca Kola is a popular soft drink produced in Peru. Some people compare this yellow-golden drink to cream soda in the United States. Ironically, I discovered this drink at my local grocery store after my trip to Peru. So, if you currently can't make a trip to Peru (you know- because you have so many travels planned), stop by your local grocery store and bring a little bit of Peru to you. Do you remember the best cup of coffee you've ever had? I do. It was black, rich, freshly ground coffee in the Urubamba Valley, Peru. So far Peru produces my favorite coffee, however I've now made it a priority to try coffee in every country I visit. I love this coffee so much that I bought several kilos of El Condor at the San Pedro Market to bring home with me. Chicha Morada is a sweet beverage made with Peru's famous purple corn. The purple corn is boiled with pineapple, sugar, cinnamon and cloves. This drink is hard to come by in Peru, you won't come across it in commercial restaurants or bars. Instead, you need to find a bar run by a local, and we have a little hint to help you out with that! If there is a pole with a red flag attached to it outside of a bar, it's a bar run by a local. Stop in and get to know the locals. Cuy is offered on almost every restaurant menu in Peru, but this is not a dish for the faint of heart. Cuy is fried or roasted Guinea Pig. Yes, the sweet little Guinea Pigs that are considered a pet in the United States, however in Peru they are considered a delicacy. Cuy can be ordered two ways, Cuy Chactado- a flatten meat, or Cuy al palo- roasted over a spit. So if you are feeling brave, don't leave Peru without trying Cuy.